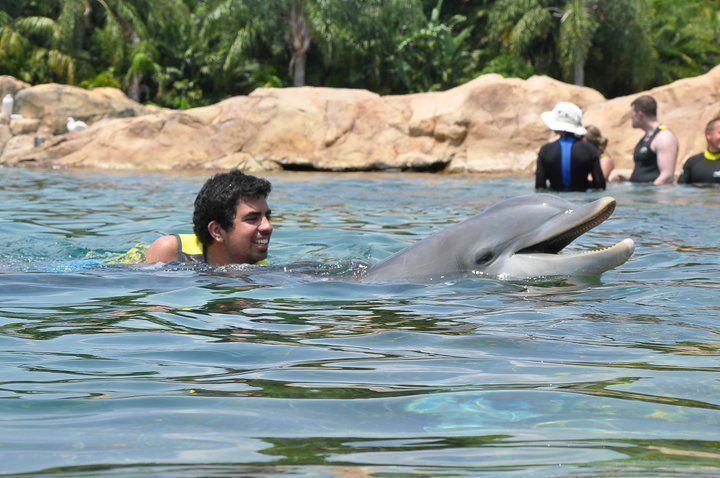 It's me Sam, swimming with a dolphin at Discovery Cove. Watching the otters from your own snorkeling tank at Discovery Cove. On a recent trip to Orlando with the team from SeaWorld Parks & Entertainment, we explored SeaWorld Orlando and her sister marinelife park, Discovery Cove. With Orlando vacation attractions that were so good to start with, it’s fun to see the standards for learning and entertainment — as well as fun — raised even higher. While Shamu has been a household name for years, the latest SeaWorld Orlando killer whale show, “One Ocean,” is sure to all but guarantee the continuity of the whale’s popularity. With more than 200 acres of exhibits that offer close access to a variety of sharks, dolphins, manatees and penguins, we felt as if we were living below the ocean’s surface by lunch time. And speaking of lunch, the “Dine with Shamu” program allows families to watch behind-the-scenes as trainers work with whales, all while lunching on the park’s menu of sustainable seafood, healthy and organic vegetables and locally sourced ingredients in all meals; check for reservation information. Be sure to check out the new Antarctica: Empire of the Penguins exhibit. It’s the biggest and most expansive attraction in SeaWorld Orlando’s history and features a ride through the South Pole for an adventure under the icy sea. 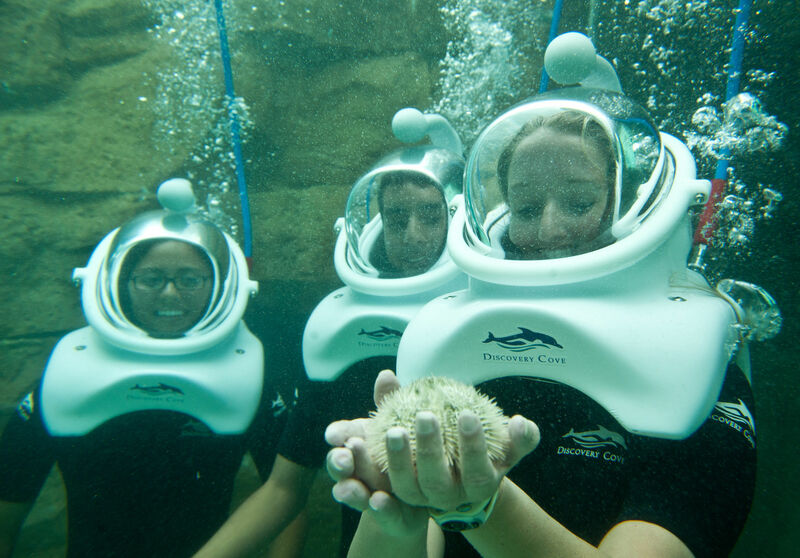 Discovery Cove, SeaWorld’s close-by sister park, offers an unparalleled experience with undersea life. With daily fees ranging from $149 to $219 per person depending on age (and whether or not you opt for the Dolphin Swim or SeaVenture), it’s an investment. If your family wants to get up close and personal with undersea life beyond the Shamu show, this could be the experience of a lifetime. The parks’ Grand Reef truly allows for a far more interactive experience than ever before. There’s an incredible, synthetic, multi-colored reef modeled after the beautiful coral reefs found in nature. Over 10,000 creatures swim with guests through the grottos and water passages. 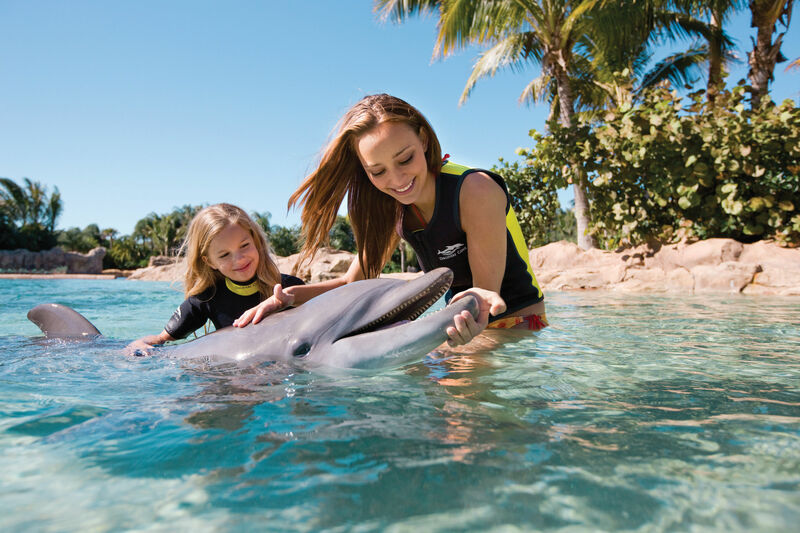 Attractions within The Grand Reef include a dolphin training and swim session for ages 6+, a lagoon with rays and trainers ready to assist, and a lazy river that winds underneath an aviary. The half-hour SeaVenture (for ages 10+) stroll under the water, where you’re protected by a helmet with breathing tube, is an amazing way to get up close with these creatures. Guests must make advance reservations for this limited-admittance park, open 8am to 5:30pm, then check their clothes and shoes for the day upon arrival. The all-inclusive price also covers continental breakfast, lunch, snacks, beer and wine, snorkel gear, towels, sunscreen, and admission to SeaWorld Orlando and the Aquatica Waterpark over the next 14 consecutive days. If you love animals and thrill rides, you can add on a day at Busch Gardens Tampa. 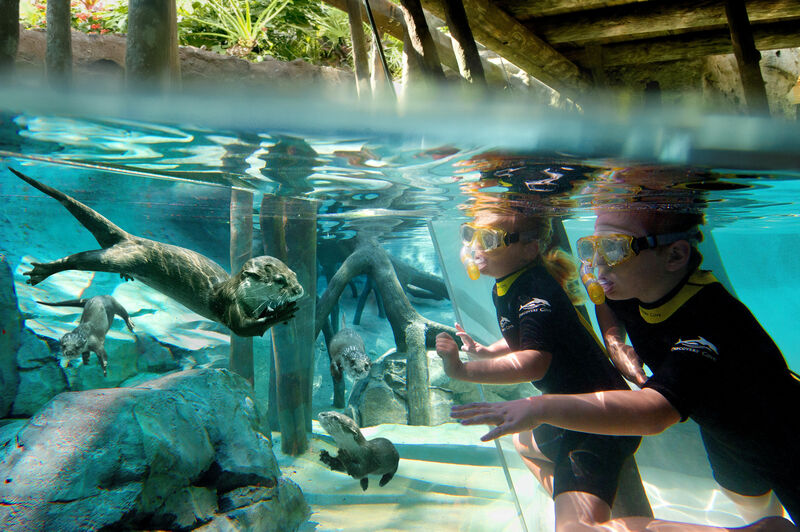 Discovery Cove’s Freshwater Oasis features a swimming and wading pool with otters and marmosets. A rainforest canopy covers guests drifting in the clear springs below. Water-filled trails take guests past friendly and curious creatures and new friends. Note that Discovery Cove, already like a one-day all-inclusive resort experience in the middle of a big city like Orlando, is also unusual because it’s one of the very few accessible waterparks, with water-resistant wheelchairs available for rent. We stayed at the Residence Inn Orlando SeaWorld/International Center (407/313-3600). It’s located at 1000 Westwood Boulevard, Orlando, FL 32821 for all the GPS users. Of course, the location was super convenient to the parks, but even better, each room has a kitchen which turned out be very useful at breakfast and snack time. Their pool is also beautiful and large enough so that you’ll want to swim even after a day at the themeparks — a good deal for about $100 per room per night. If children or parents get hot and want to spend the day in wave pool, water slides and lazy rivers, they should check out Aquatica, SeaWorld’s water park. Aquatica offers standard water park attractions in addition to the amazing Dolphin Plunge, which lets families slide through tunnels on inner tubes that pass through tanks filled with dolphins. Talk about up close and personal! Before you go, look at both websites to determine the attractions, shows and rides that interest you and the kids the most, then look at the many vacation packages. You can combine both parks, as well as SeaWorld’s sister parks, and even Universal Orlando and Wet n’ Wild in some of these offers, which can include discounted hotels, meal plans and top value multi-day tickets.